Leader of the Sicarh. He was a grandson of Judas of Galilee, the founder of the Zealot party, of which the Sicarii were a branch. Menahem checked the lawlessness of the Sicarii, who, under his leadership, in 66 C.E., stormed the fortress of Masada and slew the Roman garrison. Later they entered the fortress of Antonia, after its garrison had been forced to retreat by the Zealots under Eleazar ben Ananias, and ruthlessly murdered the maimed and helpless left behind by the Romans. 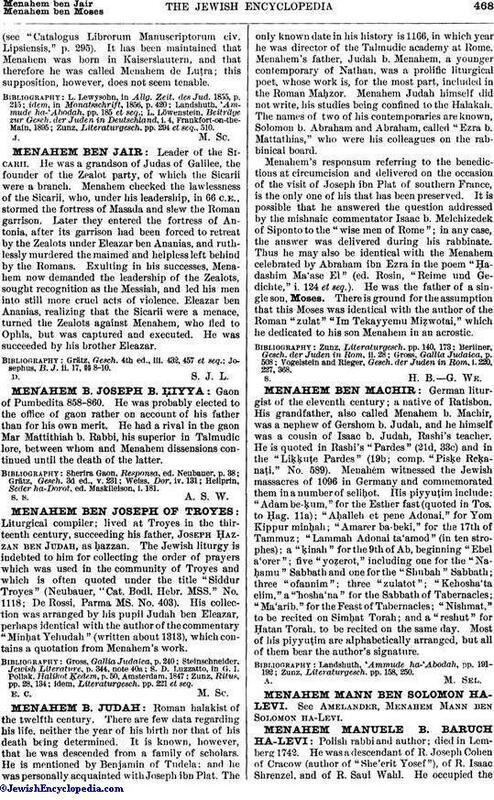 Exulting in his successes, Menahem now demanded the leadership of the Zealots, sought recognition as the Messiah, and led his men into still more cruel acts of violence. Eleazar ben Ananias, realizing that the Sicarii were a menace, turned the Zealots against Menahem, who fled to Ophla, but was captured and executed. He was succeeded by his brother Eleazar. Josephus, B. J. ii. 17, §§ 8-10.